Napoleon's mother wasn't an optimist. Whenever people congratulated Madame Mère on her imperial son's success, she would simply reply, with a slight shrug and a strong Corsican accent, "Pourvu que c'la doure!" --"As long as it lasts!" My Kindle sales for the past few days have been in the three digits, and I'm delighted. This post commemorates my books' current status as bestsellers in the top 100 of the entire Fantasy category. Ranks change hour by hour, but shining moments are priceless. I thank everyone who's reading me. Last week the Ryel Saga was included in Barnes and Noble's eBook catalog. I'm so glad I'm no longer sacrificing trees. For a long time I've kept, in addition to my journal, a list entitled Where I Was, distilling the events of a given year into a paragraph per month. It's been very handy for keeping track of travels, happenings, home improvements, significant purchases, and prevailing moods. With that data, I could readily construct a graph spanning several decades, with many a rise and fall. Lately the graph would show a marked upswing. Ever since my birthday--September 1, the start of my personal new year as I noted in an earlier post--my Kindle book sales have surprised me. In the last month, 130 people have bought my works on Amazon. Very soon, Barnes and Noble will be carrying the e-versions of my books via Smashwords, and I'll have the chance to see if it's really true that good things rise to the top. More welcome news: although I've been out of the loop for a while, today I received an invitation to attend a fantasy con as a guest professional. It made me remember the wonderful times I had at Norwescon and WorldCon, and convinced me that it's time I got out more. Finally. Among the many things that awe me, John Milton's writing is high up on the list, and his poem that inspires this blog's title came very much to mind today. The stranded despair of the opening quatrain grows ever more calm under the warming radiance of faith, and serene resignation magnifies the ending with its immortal, commisserate last line. Milton always makes me feel trivial, and I'm grateful for it. In that spirit of thankfulness I shopped for groceries yesterday in the warm bright afternoon, wishing John could have joined me. This is my favorite time of year to linger around the produce. 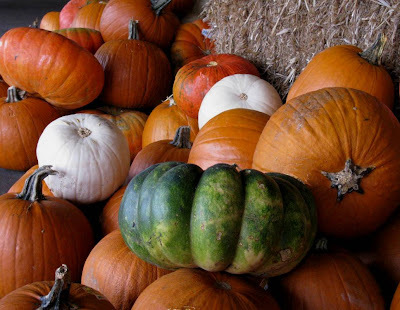 I love those odd little gourds that never quite look real, and the equally strange but kindly edible big squashes, and the regal hues of Indian corn, and best of all the pumpkins. Amid such reassuring defiant opulence death is stingless, relegated to the shelves of marshmallow ghosts and twinkly-eyed plastic skulls. Today it's rainy, a perfect time to stand and wait, or sit and write; they're pretty much one and the same where I'm concerned. When words fail me I can always wander over to Mysoju or Crunchyroll or Dramafever and escape to my lastest passion, Korean multi-series epics. Recently I finished up the splendid Jumong, 80 episodes worth of battle, intrigue, preternaturally restrained passion (not a single smooch in the entire story, despite emotion aplenty), and enthralling acting, especially by Song Il Guk who delivers a channeled, demandingly physical performance as the legendary hero of the tale. Now I'm on to the totally opposite Jewel in the Palace, which concerns itself with the mercilessly imbroglio'd woman's world of the royal court c. 1500, and recounts the tribulations of Jang Geum, who became Korea's first female physician to the king. Since she started out as a kitchen-maid, there are lots of wonderful cooking scenes lovingly filmed; the poignant soundtrack sticks to the memory, the historical recreation is big-budget and meticulous, and the lead actress is simply perfect in her plain, demure, stubbornly principled way. Both series were huge hits in Korea and many places else, and I thank the Internet for the chance to see them subtitled in their entirety. Highly recommended.